Split n Join allows the user to convert audio/movie clips into different formats, join multiple clips into one independent clip, split one clip into multiple independent files, each of which can be opened. With the exception of ZIP archives DMG disc images, Split n Join does not deal with file parts. Rather, it's designed to let the user split a single file into pieces such that any of them can still be opened even when one of them goes missing or become inaccessible. If you split a single QuickTime movie into several parts with 7Z, RAR, Split&Concat, you cannot watch any of them with a media player. And the worst part is this. If you lose any of the parts, you will lose the entire movie. Instead, why don't you just split one movie into multiple clips, each of which can be opened with a media player? Split n Join comes with a bult-in audio/video player. Join QuickTime-readable movie files (3GP, 3GP2, DV, M4V, MOV, MP4, formats that QuickTime can decode) into a single QuickTime movie. Export joint movie tracks with audio and video compressors of your choice. Join audio files of different formats into a single QuickTime audio file. Export joint audio tracks with an audio compressor of your choice. Combine multiple AVI movie files into single independent video clips. Join disc image parts (DMGPART) into single disc image files (DMG). Split ZIP files into multiple archives, each of which can be independently unpacked. Split QuickTime-readable movie files (3GP, 3GP2, DV, M4V, MOV, MP4) into multiple video clips, each of which can be independently opened. Split Matroska-container movie files (MKV) into multiple video clips, each of which can be independently opened. Split imported disc image files (DMG) into multiple parts. Click on the button to download a demo/trial version of Split n Join for Mac. 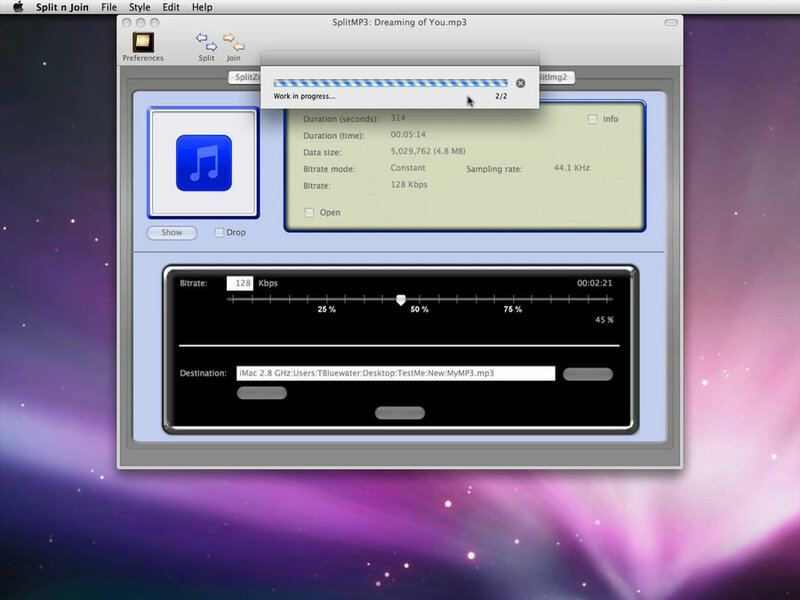 This QuickTime video shows how SplitMP3 works. SplitMP3 was first introduced with Version 2.2.0. Split n Join is not currently available. It is (or will be) separately available as Audio2Join (beta, freeware), JoinMovies (commercial) and SplitMovies (commercial). Meanwhile, we still provide support for Split n Join 2.0. Those who have purchased a software license for Split n Join 1.X can upgrade their licenese for $7.95. Fix: The command-line tool counterpart for AVISplit was available for PowerPC. So AVISplit ultimately failed under Snow Leopard. Now, this command-line tool is in Universal Binaries. Fix: SplitMKV could fail when the split size had a decimal point. So the application now forces the user enter a positive integer as a split size. 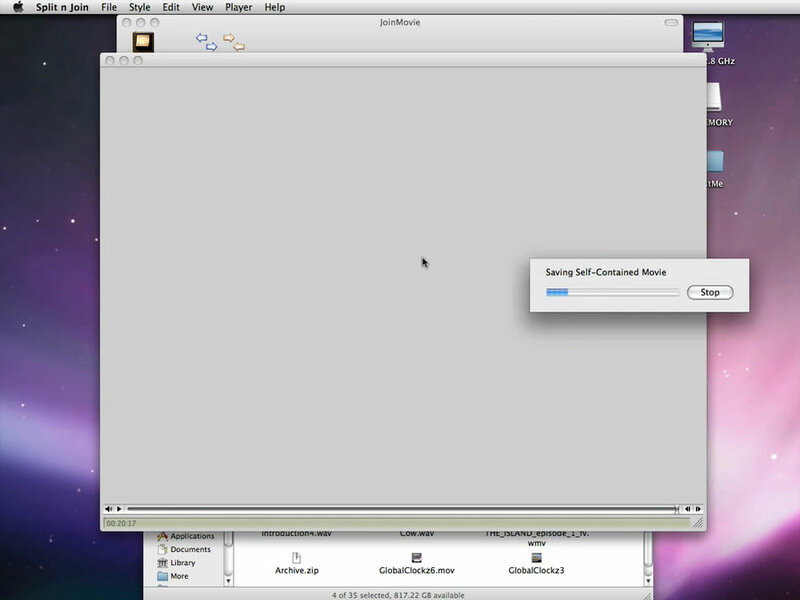 The application can regenerate preference files when they go missing. Fix: The Download command (Split n Join > Download) was disabled in the last update for licensed users. We are sorry. Please refer to the License e-mail message to download the latest version this time. Methods that are to be deprecated by IDE software are replaced. A couple of new commands are added to the Help menu. Fix: The duration of the movie in timecode could have been inaccurately shown on SplitAVI and SplitMKV. SplitMP3: The user is no longer required to set an audio bit rate. SplitMP3: When the user clicks on the Split button, progress bars will appear inside the display window, showing real-time export progress. A new component (SplitFLV) is available. Similar to SplitMP3, you can use SplitFLV to split FLV video clips into 2 independent clips at a chosen time position. Click here for more information. The user is now able to set default audio/video/disc image names in Preferences. To set default file names, see the tab labeled System files. Click here for more information. Several more minor changes/fixe are made. Unused graphic files from Version 1 are thrown out. FlattenMOV is removed from Split. It's renamed Flatten and is installed under More. Fix: If no video player is open, Window > Bring Media Player to Front will be disabled. SplitMP3: Choosing Player > Set Timecode on the media player, the position of the play head in terms of time code will be transferred to the split slider. Click here for more information. SplitMP3: The split button will become accessible if the specified audio bit rate is greater than or equal to 64. It will become inaccessible if the value is non-numeric. Several minor changes/ fixes/ improvements are made. By pressing the space bar (not space + Shift any more! ), the user is able to stop the ongoing movie. The user no longer has to manually play back a movie to change speeds. By pressing Command + 0, Command + 1 ... + Command + 3, the movie will automatically start with the selected speed. Pressing Command plus + and Command plus, the user is able to zoom in and out movie screen. Several more minor fixes and improvements are made. Preferences window will open at the same position as the main window even when the user chooses Split n Join > Preferences. A new feature is available. FlattenMOV allows the user to convert any number of reference movie files (MOV) into self-contained movies. Click here for more information. SplitImg1: The split process will be handled with a complete progress bar when encryption is not enabled. SplitImg2: The split process will be handled with a complete progress bar when encryption is not enabled. JoinImg: The join process will be handled with a complete progress bar with or without the encryption option on. Some warning messages under Split components are fixed. Fixed is a bug that caused the application to show a wrong video resolution consistently under SplitMOV. The DropOpen feature with QuickTime-based movie files (3GP, 3GP2, DV, M4V, MOV, MP4) are also fixed accordingly. Some minor HelpTag changes are done. Split n Join now supports additional media formats for drag-&-drop open. Dragging and dropping a QuickTime-readable movie file onto the application icon will open the file and read it under SplitMOV. Dragging and dropping an AVI movie file onto the application icon will open the file and read it under SplitAVI. Dragging and dropping an MP3 audio file onto the application icon will open the file and read it under SplitMP3. Newly available is a Toolbar button named 'Open.' This Toolbar button gives the user a drop-down menu to select a media folder to access. 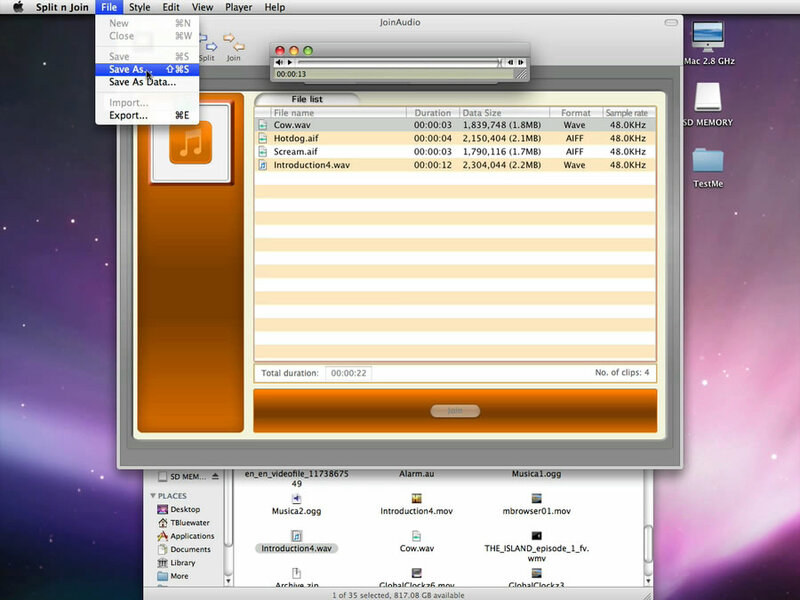 The user can set up to 5 media folders in Preferences. Fix: Application will start up without showing invisible menu items at the beginning. SplitMOV: Clicking on the cancel button on its progress window will cancel the operation effectively and immediately. 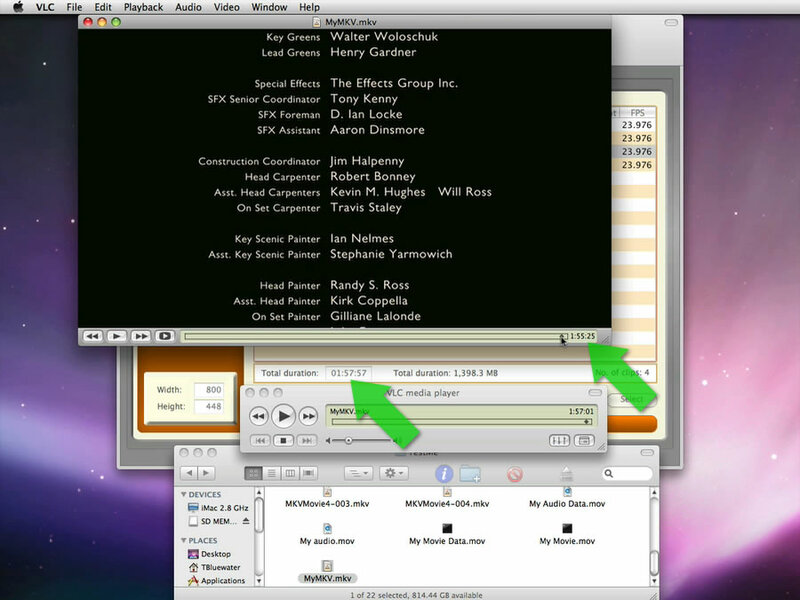 SplitMOV: The built-in movie player shows the name of the file at the top of its window. A new Split feature is available. SplitMP3 allows the user to split MP3 audio clips into halves, one file at a time. Click here for more information on SplitMP3. A new Join component is available. JoinMKV allows the user to combine multiple Matroska-container movies into one clip. Click here for more information. Fix: View > Half Size - The actual height should be 20 pixels larger. Fix: View > Actual Size - The actual height should be 20 pixels larger. Fix: View > Double Size - The actual height should be 20 pixels larger. Fix: View > Triple Size - The actual height should be 20 pixels larger. 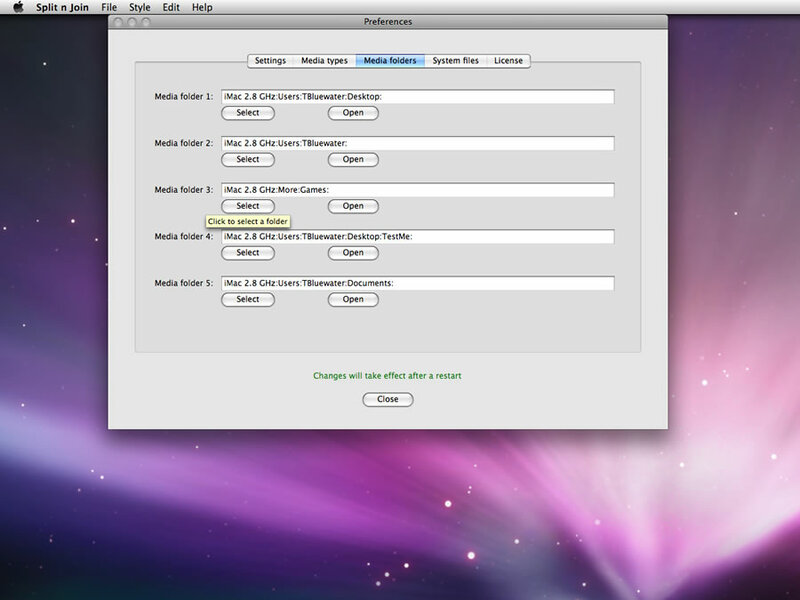 Clicking on the Select all checkbox in Preferences will let the user select or deselect all media types. Several minor changes and improvements are implemented. Bug fix: A serious license validation problem is fixed. Split n Join is a product of MacHouse.